I love installation art, and I think of my jewelry as human installation pieces- wearable art! I am also a portrait photographer, a graduate of the Art Institute of Philadelphia, and my passion for portraying emotions in a flash of time is evident in my mixed media art, all of which include my photographs, printed using my favorite alternative printing methods and put together with clay and paint, organic, vintage, and shiny new materials. I left the corporate world to pursue Landscape Architecture, a more creative profession. Then I took up Mosaics during the long Colorado winters when gardens were dormant but my creativity still needed an outlet. I love taking things that are broken and reassembling them into different patterns to give them new purpose. I enjoy working with bold colors, recycled materials and different textures to create whimsical pieces, many of which evoke a garden feel or purpose. Welcome to "A Crane Creation"—where polymer clay, fused glass, chainmaille, beads, found objects, metal work, resin, photographs, wire crochet, passion and play join together in fabulous jewelry art and couture home dècor. The aesthetics range from: whimsical to elegant; O'Keefe to Mondrian; a whisper to a shout. By teaching jewelry-making classes, I also have the pleasure of supporting others explore their creativity in a fun, supportive environment. Kathy Daly of KDaly Photography is enjoying her second career after spending over three decades as a high school yearbook and English teacher. One of her favorite subjects to teach was photography, especially as it applied to journalism. Now she concentrates on photographing individuals and families (especially children) as well as special occasions. She also instructs small groups about how to use their own DSLR cameras. A fascination with contemporary botanical art began at the Phipps Conservatory in Pittsburgh, PA where I eventually taught botanical watercolor technique. I strive to capture with precision the beauty of a plant at a particular moment in time. Using a combination of watercolor, colored pencil, tempura and graphite I work to achieve a three dimensional painting. Slowly explore the detail of each subject and pause to appreciate the complexity of nature. I am originally from the AZ bordertown, Nogales, AZ, and the offspring of hard-working and talented Kansans. I spent a large part of childhood and graduated high school in Denver, where I now reside with husband Joshua, and kids Hannah, 9 and Levi, 7. I studied Advertising/Journalism at the University of Kansas, and am currently finishing my MFA in Illustration, after painting oil and acrylic for 20 years. I love to delve into any subject that inspires me--whether it's a landscape, still life or a figure. A signature member of the Colorado Watercolor Society, David paints in watercolor and oil, especially old buildings associated with Colorado's mining and ranching industries. Intrigued by geometric shapes, David has recently zeroed in on parts of old machinery - agricultural and automotive - resulting in bold paintings of these subjects, with strong color being used to emphasize the shapes. He is associated locally with Art and Framing at Stapleton. My philosophy in life is to use every day as an opportunity to rewrite your story. To define who you are and what you do according to your own personal beliefs and desires. Every work of art serves as a serves as a stepping stone to an open window of endless creativity, an opportunity to explore, create and rewrite my creative journey as it continuously evolves into a wonderful palette of creative expression. My mother was an artist so painting always seemed like a natural part of life to me. After graduating from University of Denver (BFA) I enjoyed a successful career as a Creative Director. Since 2008 I have studied with Chuck Ceraso, Molly Davis and Ken Massey. Currently, I am painting (studying) en plein air at Stapleton’s parks and trails nearby. My work is about observation and developing a refinement of seeing..color, luminosity, atmosphere, shape, form and the visual experience. I started painting later in life, although not as old as Grandma Moses. Long fascinated by watercolors and acrylics, I have begun experimenting this year with acrylics on raw canvas, taking a page from the "Modern Masters" such as Clyfford Still, Helen Frankenthaler, Jackson Pollock and others who painted on raw canvas. Some paintings are abstract, while others are inspired by closeup photos of flowers in my garden and those of friends and neighbors. Several years ago I became interested in making art for the outdoors. My vision is to place art amongst the natural beauty in nature. 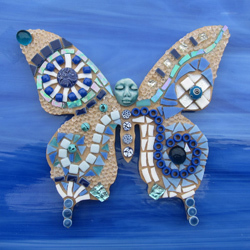 This series of mosaic stepping stones is created with a variety of materials that embrace an outdoor environment including a combination of tile, stained glass, glass beads and my own shaped clay tiles. Paintings are wondrous mirrors to see life within and windows to see life without. I paint and draw impressions-within and without-of nature and people. I paint landscapes and still lifes in and around Stapleton and sometimes in different time zones. I paint portraits and figures from a variety of cultural themes to attempt understanding. At my home studio you will see stages of realistic and abstract painting. For most of my life, I have been exploring more direct approaches and techniques in painting and mixed media. The immediacy of Watercolor intrigues me for its capture of the artist's moods and feelings m.ixed media collages offer an expression through color and composition. Through my work in advertising graphics, I also had great success in the past with a series of photo and art collages depicting how I viewed the character and beauty of Denver's older neighborhoods. Produced as marketing posters, some even had a transformative impact on improving the neighborhood. I hand build and wheel throw decorative vessels from clay. Although my forms have changed over time, my instinctual love of the Earthiness of clay remains the same. Nothing trumps the feeling of potential when I open the lid of the finished kiln to see what the fire has done to the Earth. It's better than Christmas morning. painting techniques. Resulting AspenSPACES typically include as many as twenty layers. Her formal art training began in the 1970s at the Art Students League in NYC and a BFA from the University of Bridgeport, CT. Her work is held in both public and private collections around the world.. Lelija’s AspenSPACES can be found in galleries in Sedona, AZ as well as Denver, Breckenridge and Vail, CO. Commissions are always welcome. As an artist, I am driven by eye appeal. I have a passion for people, gain energy from my environment and am motivated by the emotional reward I receive when others appreciate my work. I am often asked, "What is fusion art?" Quite simply, it is as you might imagine. It's when multidisciplinary art mediums converge into one fine art piece. For me it is where products from the camera meet technology and other modes of creative expression. An accomplished and widely published non-fiction writer, Betsy turned her creative energy to painting with acrylics following a diagnosis of Parkinson's disease in 2009. "The brain changes and medicines that accompany PD often release creativity in people living with the disease. The phenomenon is not well understood. I am just so happy to have this passion, which distracts me from the shakiness, slowness, and stiffness that sometimes take over my body." As a three dimensional, multi-media glass artist, I start with the highest quality hand blown crystal forms. I encapsulate each piece with a rubber resist, hand draw a design, then I sandblast, carve, cut, and clean the piece to conclude the process. The addition of paint, stains, and other elements of glass in some of my pieces adds balance to its more formal elements and creates a sense of texture on the smooth, clear, surface. Color, shape, and perspective are a focus in my mostly representational paintings. Currently, I like to use complimentary and primary colors, as well as space and composition to create emphasis on shape and juxtaposition in my images. I look forward to sharing my process and my work with you!